I know I said this about Sunday too but seriously, Monday! What a day!! Had you actually told me what I would end up doing beforehand, I never would have believed you! So started off the day by visiting a reservoir and taking lots of photos to try out my new camera. That was nice to see lots of trees and greenery, not something I normally see a whole lot of in China. We then had a nice lunch and I finally ate some JiaoZi (chinese dumplings) which are an absolute favourite of mine! After lunch we went up and visited the orph.nage again as the kids have a few days off school for a festival. (they have a lot of festivals here!) We thought they had the day off to play around and have fun, but... that didn't exactly happen... The kids ended up shovelling a room full of coal into two trucks to be moved to their new location. I was a bit taken aback when I first saw them doing it. When we got there some of them were cleaning their feet, which were BLACK! When lots of the kids saw me they called out 'brother!' and seemed happy to see me!! We then went inside and played a few days with some of them, and met this incredibly cute girl who has some big personality! Later on she started calling me Baba (father) and Lucia Mama and one of the other boys (GeGe) and pretended we were a little family! It was very cute! From what I understand, most of these kids have living parents, but many are in jail so cannot look after them. So sad. But then the kids were all called back out to start working again. None of them seemed to mind. The younger kids (age about 3-4) don't have to do it thankfully. At first I played with them but then went and helped with the coal. Believe me, I never thought I'd end up shovelling coal all afternoon. The kids were SO great though. They never complained and just got on with it. Made me feel bad for complaining to my mom about little things like cleaning my room! So we shovelled and shovelled. The director brought us out some face masks thankfully as I can't imagine coal is good for your lungs. We did get through it all. By the end we were filling up baskets and dumping them into the truck. 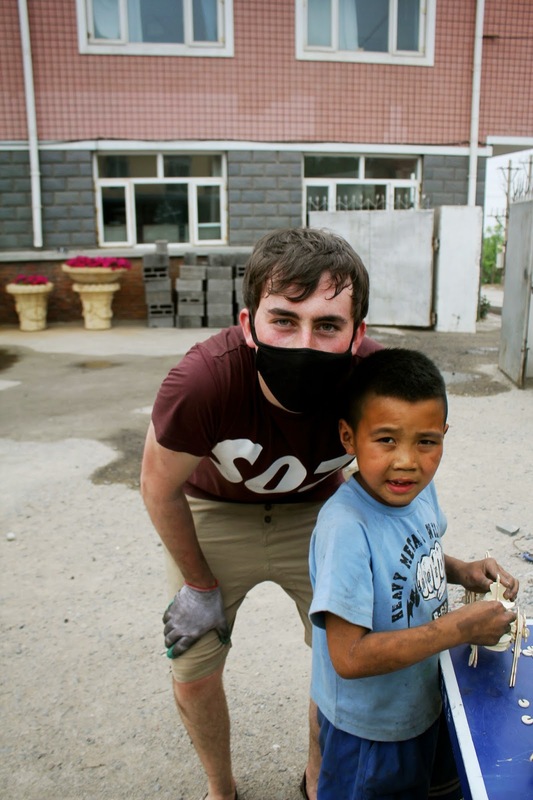 My little friend HaiLang from yesterday would only let me help carry his basket! When it was full he would shout out 'brother' and I would run over and help him! He was completely black by the end of it!! It made me really sad that these kids are expected to do so much :( Their childhoods are VERY different to mine. They still joke about, and seem to be taken care of well in other ways. It's still sad though. We then got basins of water and cleaned our feet of all the coal. HaiLang was so dirty but Lucia and I helped clean him! He seemed to like that! That evening I was completely exhausted after working so hard! Ate a quick dinner and just relaxed for the evening. I'm gonna miss these kids... The directors told me I could come back and visit any time. I may have to do so. I wish SO much that I could take HaiLang home with me. He is SO smart, hard working, affectionate, an all around great kid. Thank you for sharing! Your photos look great so congrats on your new camera! Can't wait to follow the rest of your trip! Oh! That was sad, and brilliant and so moving and uplifting. It makes you rethink the things you complain about and consider life on the other side of the planet, or even right outside your door. I loved the pictures, they are fantastic.